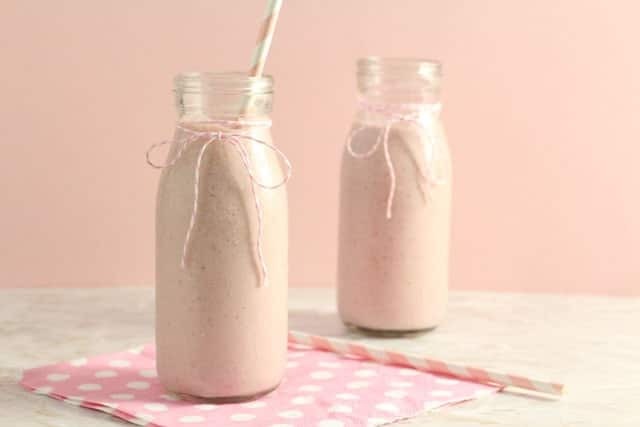 Naturally packed full of protein, this Raspberry Quinoa Smoothie makes a really delicious and healthy snack for the whole family! Hi, it’s Ciara here from My Fussy Eater. It’s a delight to be back here on Super Healthy Kids sharing some ideas and recipes for picky eating families. This month I’m sharing one of my favourite and super nutritious smoothie recipes. When it comes to making snacks for kids, we know that protein is key to keeping their little bellies full until mealtime. Meats, cheese and many pulses and beans are great sources of protein but these are usually the exact foods that picky eaters turn their noses up at. 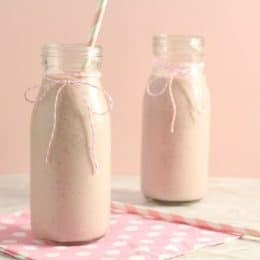 In an attempt to get more protein into my daughter’s diet, one day I decided to add some cooked quinoa to my daughter’s smoothie and I was very pleasantly surprised with the results! Quinoa is a “complete” protein source, meaning that it provides the majority of the essential amino acids our bodies need. 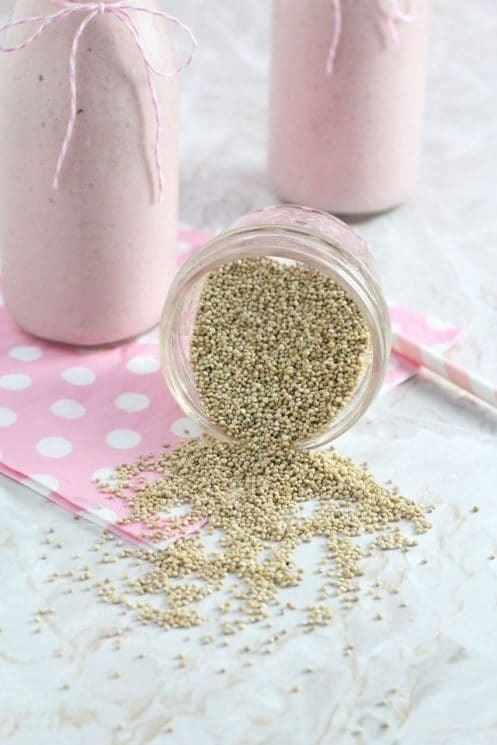 This quinoa smoothie can add up to 8 grams of protein to a child’s diet. It is also an excellent source of fibre and iron and is gluten free. 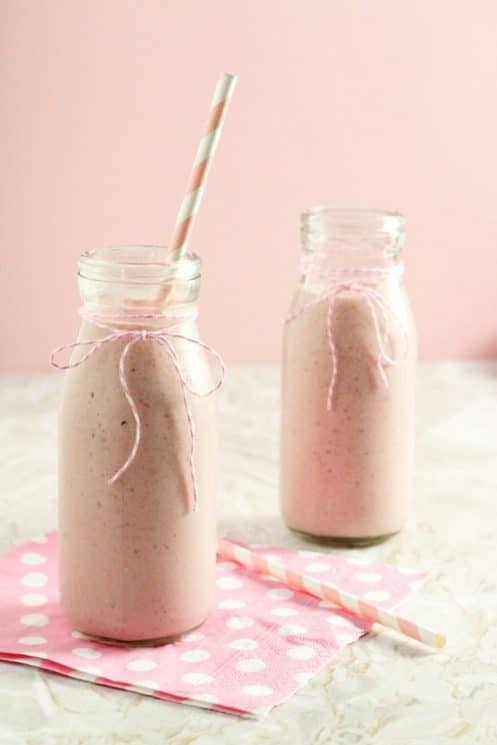 In order to break the cooked quinoa down, this smoothie takes a bit more blending than a regular smoothie. After a couple of minutes the quinoa should be completely blitz leaving you with a delicious and smooth drink. 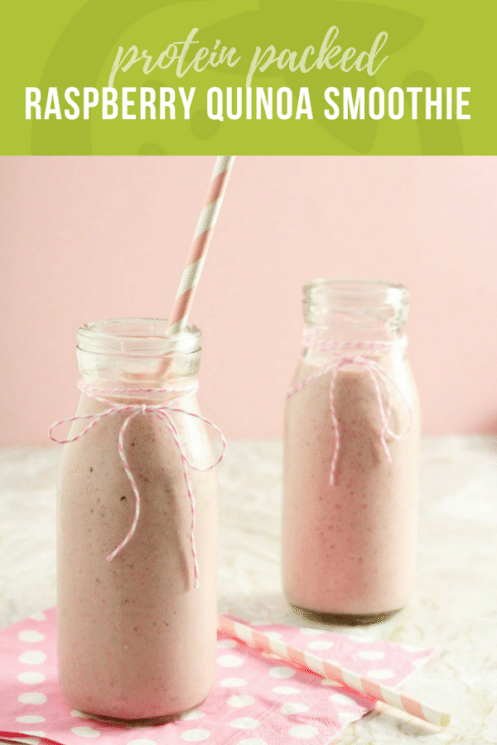 I usually serve this smoothie as a snack but it would be a great addition to breakfast too. It would also be a really healthy post-workout snack for sporty teenagers. It’s certainly a lot more nutritious than artificial protein shakes. Cook quinoa according to package directions; let cool. Add all the ingredients to a blender and blitz until smooth (add more ice if needed). Pour into glasses and serve immediately. This looks great! I can’t wait to try it out on my selective eater! If I have already-cooked quinoa, how much would that be – about a cup? Thanks! You’re probably not looking for the answer over a year later but someone else might, so… one cup uncooked quinoa makes about 3 cups cooked. Just made some glasses for my beloveds last week! really yummy!! 1 cup uncooked, do you use all of that in the smoothie? You can use as much as you want, you don’t have to use the whole thing. It wasn’t good (to me) until I changed it a bit. I replaced the Greek yogurt to vanilla flavor, and added 1/2 tsp honey. I also froze raspberries and added 1/2c water to replace ice. The recipe itself is good as a base, but alone it taste like yogurt and quinoa.